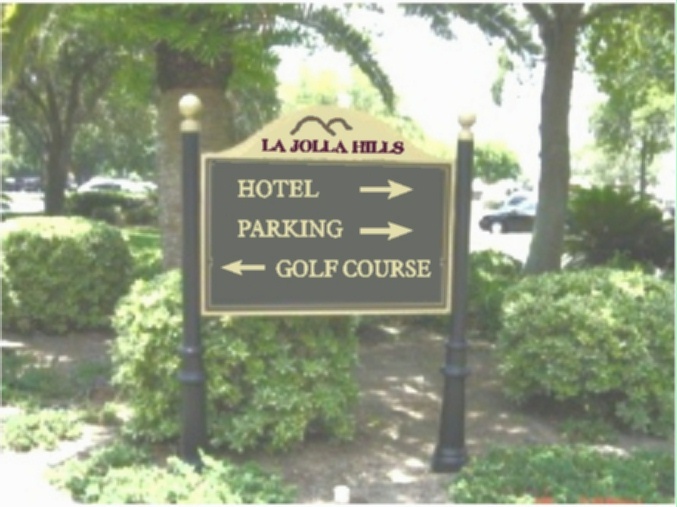 This post and panel wayfinding sign is carved with engraved text and logo on top and raised letters below.After artist painting, the sign is clear-coated twice for additional weather and UV protection. Round aluminum posts 3 inch in diameter were used with a short Europa base (see Gallery 4 for design options on posts). Please click on Home to see our Home page. You can click on one of the numbered gray boxes on the lower left margin of this page to visit other Photo Galleries, such as signs for restaurants, bar & pubs, and wineries. You can search for a specific sign type on this website by typing in key words in the Google Search bar at the top of this page. You can use the navigation dark gray tabs at the top, or the gray boxes on the upper left margin to see other information such as "Prices & Design Options" and forms for "Request a Quote and Design" and "Place an Order".